I like this book because Amy Anne and her friends did something brave. I would never do something like it. 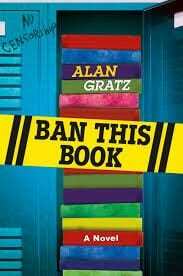 Ban This Book is a spectacular book about a young girl named Amy Anne and how she starts the Banned Book Locker Library when her favorite book gets banned from the school library. Amy-Anne has always been as timid as a mouse. Sucking on her braids and having conversations mainly in her head. She was quiet, that is, until her favorite book in the whole wide world was taken out of the library. With the help of her lawyer-friend and other accomplices she starts the BBLL (banned books locker library) but soon, she’ll have to find her voice and stand up for what she thinks is right. Amy-Anne isn’t going to be a mouse forever. How do Amy’s actions and involvement in speaking out against banning books change her? books can do, they can’t make you into a bad person” Explain why you agree or disagree.